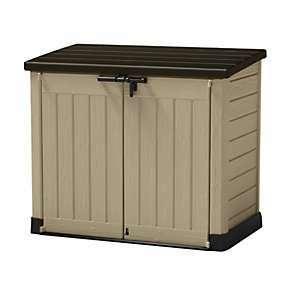 1200 L polypropylene garden storage unit for garden furniture, lawn mowers, barbecue equipment and other outdoor items. Also accommodates two 240 L wheelie bins. 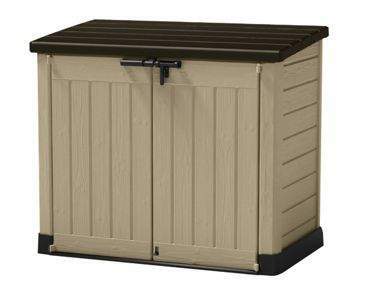 Designed for easy assembly and virtually maintenance-free. Fantastic piece of kit. I bought one for my wife and she is still in there! Heat added, I got this on their Black Friday deal for £95- they are a decent size, got all my camping gear in. Of course! No returns accepted though..
How can it be 4 x 5 Ft ? The dimensions are 820 mm x 1450mm x 1250mm ? Do like I did with my wife... cut in pieces!